Derale Transmission Cooler - Frame Rail UNIVERSAL - Dezod Motorsports Inc - Home of the automotive performance enthusiast since 2002. With the same 1/2” copper tubing expanded into aluminum cooling fins and embossed turbulators as our larger transmission coolers, this cooler uses a slim design to enable frame mounting in limited space applications. 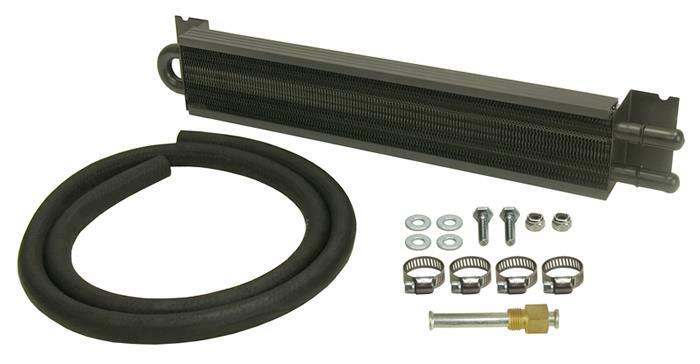 This kit comes with a complete transmission cooler hardware kit to easily install onto vehicles with 5/16” transmission cooler lines. Perfect for light-duty use and occasional light towing.